This course will explore travel in the ancient world, from technical feats of engineering infrastructure like roads and bridges, to fantastical accounts of peoples encountered on Jason and the Argonauts’ pursuit of the Golden Fleece; from its earliest descriptions in works like Homer’s Odyssey, to medieval pilgrims’ journey across northern Spain on the Camino de Santiago. We will examine textual evidence in translation, such as military descriptions of Alexander the Great’s army moving across Anatolia, the diary of a Roman traveler in Greece, a late antique handbook to sailing the Red Sea, and early Christian pilgrimage accounts to Jerusalem. We will survey artistic and archaeological evidence for travel: the physical remains of Roman roads, ancient Greek shipwrecks, and other monuments – like bridges, harbors, and city gates – that allow us to reconstruct ancient travel networks and their role in trade, mobility, and the spread of empire. We will discuss not just the how of ancient travel, but also the what, the why, and the who, with a focus on the goods and peoples who traveled around the ancient Mediterranean, but including forays into the Red Sea, the Indian Ocean, the Atlantic Ocean, and the Persian Gulf. 1. Motivations: Why did people travel in the ancient world? What sort of economic, political, religious or other factors went into their decisions to travel? You will learn to formulate questions appropriate and relevant to archaeological research, and subsequently to develop coherent arguments based on the other objectives (below), synthesizing them with a critical consideration for the nature of ancient travel, in both written work and class discussions. 2. Context: What sort of world were people travelling through, and how did that impact where and how they went? You will learn to analyze the nature of ancient travel in its historical context, gaining the ability to call on specific historical examples grounded in political, social, religious and cultural context. 3. Destinations: Where were they going, and how far were they going to get there? Why? You will learn to identify what kinds of places people were traveling to, and what about those places drew visitors. They should be able to distinguish the religious, commercial, leisure, etc. functions at a given destination that would draw visitors, and to define what a destination is. 4. Infrastructure: How did they get to where they were going? You will acquire the appropriate skills for tracing roads in the ancient world: archaeological, literary, and cartographical sources. Casson, Lionel. 1994. Travel in the Ancient World (revised edition). ISBN-13: 978-0801848087; ISBN-10: 0801848083. Johns Hopkins University Press. Staccioli, Romolo. 2004. The Roads of the Romans. ISBN-13: 978-0892367320; ISBN-10: 0892367326. J. Paul Getty Museum. PowerPoint slides, images, and other supplementary material and resources such as the class bibliography will be posted to Blackboard for your reference. Select readings will also be made available on course reserve at Strozier Library. Quizzes: Occasional short, in-class quizzes will gauge your comprehension and reactions to the readings (especially the primary sources), previous material, and geography. Quizzes cannot be made up without a documentation for an excused absence (e.g., a doctor’s note). You can miss two (2) without penalty. Write your own travelogue/guidebook is a creative assignment that relies upon your experience; you will formally reflect upon this assignment in-class at the end of the semester. ORBIS Project: Your major semester project relies on the ORBIS geospatial model of the ancient world (http://orbis.stanford.edu/), and requires you to select trips recounted in ancient itineraries and discuss them within the context of predicted travel times, distances, and seasonality. Instead of a traditional paper format, these projects will be presented as online essays, in order to incorporate visualizations of these routes. However, the organization and written quality of the work must adhere to research paper standards (see attached essay rubric). You will submit a 1-2 page proposal outlining your plans for this project on April 3. The final product will be the equivalent of a 6-8 page paper (minimum 1500 words, not including bibliography). The text will be submitted in .docx or .pdf form to Turnitin alongside the online version (you can simply copy and paste into the document from your online exhibit). Except for changes that substantially affect implementation of the evaluation (grading) statement, this syllabus is a guide for the course and is subject to change with advance notice. Any changes to the schedule of readings, assignments and class meetings will be announced and updated on the Blackboard site for CLA4930. Students are responsible for checking their email for announcements and for checking the Blackboard site regularly for announcements of changes to the readings and meetings. Pulak, C. M. 2008. “The Uluburun Shipwreck and Late Bronze Age Trade.” In Beyond Babylon: Art, Trade, and Diplomacy in the Second Millennium B.C. edited by J., K. Benzel, and J. Evans. New York and New Haven, CT: Metropolitan Museum of Art and Yale University Press, 290-304. 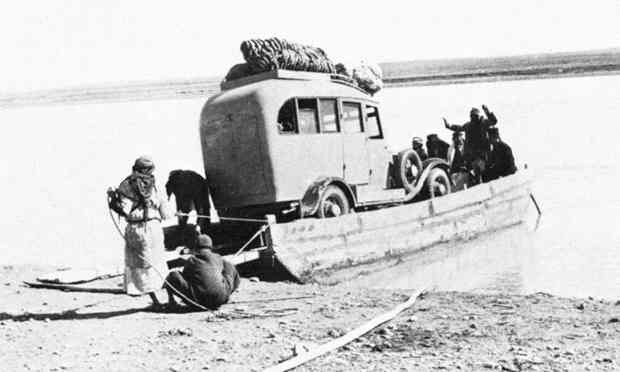 Agatha Christie crossing the Euphrates in Syria, 1946.